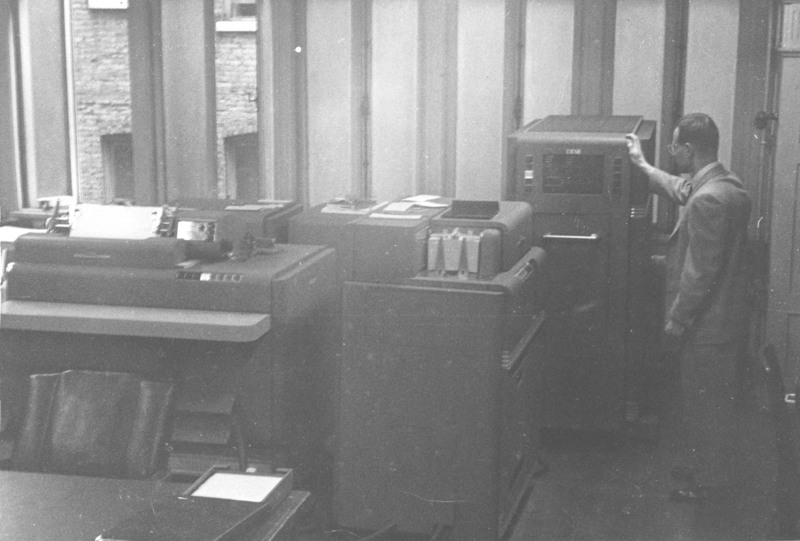 Eric Hankam in the machine room at IBM Watson Laboratory at Columbia University, first floor, 612 West 116th Street, New York City, about 1955. In this view we are looking at the Watson Lab Card Programmed Calculator. Left to right: an IBM Type 412 or 418 Accounting Machine (which is a 402 modified for use with the CPC), a Type 527 High-Speed Punch, and a Type 605 Calculator (which is a 604 specially designed for use with the CPC). Behind the accounting machine and left of the punch, near the window, is a 941 Storage Unit (relay memory). Later this room would house an IBM 650 and a 1620. Photo from the collection of Eric Hankam. Click on image to magnify to full size.